This HDMI audio extractor can extract the digital HDMI audio signal from the HDMI input and convert it to HDMI and SPDIF+R/L audio output. The SPDIF output can support 5.1CH audio including Dolby Digitla 5.1CH and DTS 5.1CH(Dolby Digital Plus and PCM 5.1CH not supported).Audio EDID settings: Pass, 2CH and 5.1CH. 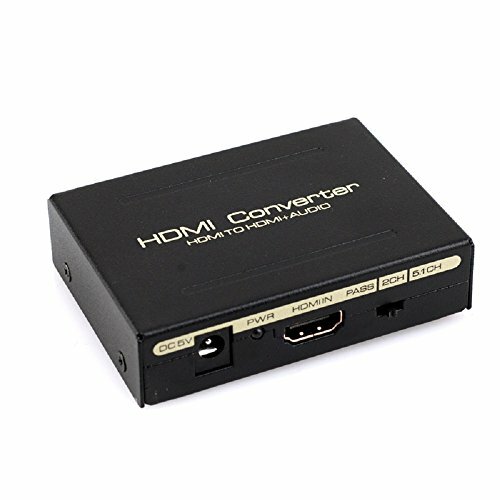 This converter can extract the digital 2CH PCM stereo audio signal from the HDMI input and convert it to 2CH analog stereo output through its RCA style L/R analog output AND SPDIF output at the same time. Supports 24 bit /deep color 30bit, 36bit per channel (36bit all channel) deep color, supports HDCP, Video EDID pass through and supports AppleTV and various Blu-ray player.